In a fresh dusting of December snow in the winter of 1974, a small gathering of students and their teachers from The Lewis School of Princeton quietly celebrated the lighting of the school’s first Tree of Light. Ten thousand tiny hand-wired globes shone radiantly in the darkness, an achievement that took two months of diligent, painstaking work and perseverance. Marsha Lewis, founder of the school, had originated the project as the theme of the holiday festivities to raise public awareness and understanding of persons who learn differently. Convinced that the experience would help her student volunteers learn the importance of patience, tenacity and team spirit in any undertaking, Marsha Lewis chose as the project’s coordinators several of the most impatient, oppositional individualists in her senior class. As the work proceeded from one string to hundreds, the students began to realize the monumental nature of their task. They had not anticipated, however, the support for their project expressed daily by enthusiastic neighbors, townspeople and holiday visitors in Princeton. Passing cars honked in rousing approval to cheer on the troupe of stalwarts working in the freezing drizzle late into the evening. The bitter cold, numb fingers, aching feet and strings of lights that shorted out again and again were soon forgotten. As well-wishers stopped to admire the tree, the students explained their project’s significance. The tree and its thousands of lights symbolized a message of hope and encouragement for people everywhere struggling with learning and literacy, people whose talent, potential and uniqueness had never been discovered for want of appropriate educational tools and enlightenment. The students themselves could still remember when they had felt paralyzed by the frustration and fear of failure, humiliated by feelings of inadequacy because they had not learned to read and write in a way that reflected their innate ability to imagine and understand the world around them. Their labor in this project was worthwhile and The Tree of Light became an experience they would remember with pride. In November of 1991, word of our student project reached Washington, D.C. and in early January of 1992, The White House called on behalf of Barbara Bush. Of the thousands of projects to come to her attention, the First Lady wished to recognize The Lewis School’s Tree of Light as one of the most outstanding and worthy. And in 1993, the eminent journalist and NBC’s news anchor, John Chancellor, our guest speaker, said that our Tree of Light shone more splendidly than the one outside his window at Rockefeller Center. 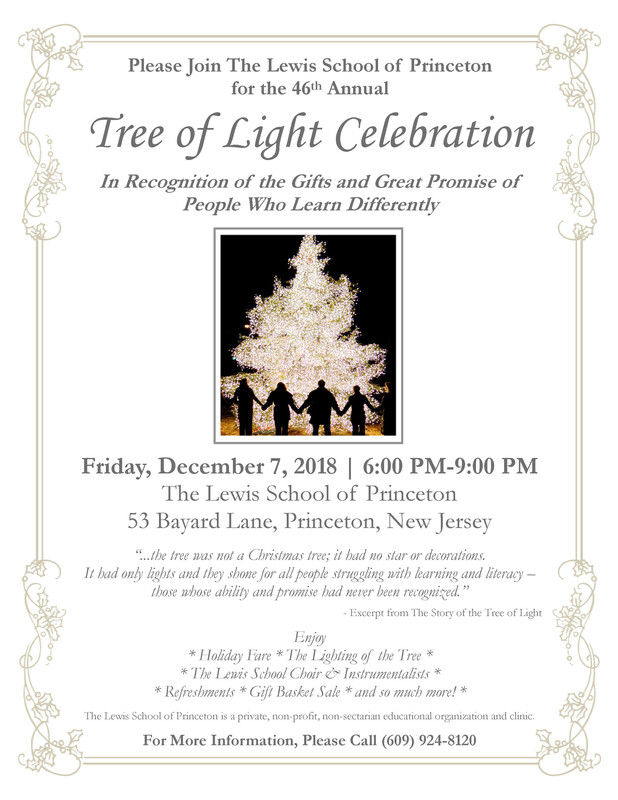 Through the years, the ranks of participating students, faculty and parents have swelled and The Tree of Light has become an annual tradition at The Lewis School. With each new year, the students learn to set and stay the course. They speak candidly and realistically to others about their own learning differences and the moment-to-moment challenges they face as persons who learn differently. They discover, through participation and commitment, what it takes to change an arduous task into a celebration of beauty, purpose and meaning: meaning to be shared by all those who pass by.